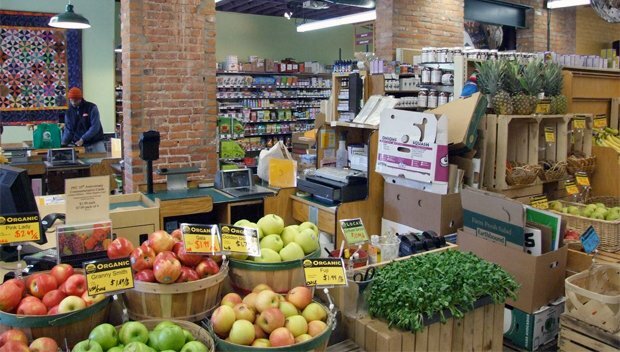 Guest Post: A Food Co-op in Pittsfield?! Renaldo Del Gallo wrote the following article,“Exploring a Pittsfield Coop”, published this past Saturday in the Berkshire Eagle. The first organizational meeting for the Pittsfield Food Co-op is tomorrow, Wednesday May 30th 6:30 pm at the Unitarian Church, 175 Wendell Ave, Pittsfield. Please join us! A cooperative, or “co-op” for short, has been defined as “a business owned by the people it serves,” although you don’t need to be a member to buy at the Berkshire Co-op as you would at BJ’s. Nor do you need to be a member to shop at Wild Oats Market, a co-op in Williamstown that focuses on local producers. But if you live in Pittsfield, you are out of luck. There is no food co-op here. I asked the trio, “How is a co-op different from a regular grocery store?” A food co-op looks like other businesses since it sells products just like any other grocery store, but differs behind the scenes. Unlike a BJ’s where being a “member” is really a fee to get in the front door, a co-op is actually owned by its members. The co-op exists solely to serve the needs of its members. Unlike traditional corporations with traditional stockholders, the members are local members of the community that use the co-op. The governance is a democratic one, and co-op members elect their own board. Co-ops distribute “surplus revenues” (profits really, or income above cost and reinvestment) in a highly unusual way. Rather than it going to shareholders based upon “shares” owned, profits are redistributed to members based on their use of the cooperative. Therefore, they are called “patronage dividends,” as opposed to the typical stockholder dividend, because the return is based upon how much business the member has done with the cooperative. A traditional corporation owned by non-local shareholders almost always results in a profit-driven purpose. Because owners are not local, the profits are usually spent outside the community. Sure, traditional corporations can be socially conscious, but mission number one is always profit and is their raison d’être. To be sure, a co-op is a business just like the traditional corporation. It often has a corporate structure and has a corporate existence on file with the secretary of the commonwealth, or the local equivalent in whatever state it is located. The co-op must be economically sustainable like any other business if it hopes to be around. And it is a business — not a club or an association. But the raison d’être of a co-op is to serve the needs and values of its members, not monetary profit. Since meeting the needs of its members is the sole purpose of the co-op, greater social goals and the benefit to the local community are placed ahead of profits. Rinaldo Del Gallo is an occasional Eagle contributor. How did your organizational meeting go? I don’t know what size a town Pittsfield is but thought you should know about our local food coop in Wooster, OH.